When you’re surrounded by beautiful scenery, it’s easy to overlook the small details that make a scene special. But there’s no substitute for the pleasure that comes from spending a little time in a scene, identifying its intricacies, and creating an image that conveys this connection to others. Capturing these intricacies can be the most rewarding aspect of photography, because they’re almost always uniquely reflective your own vision. People frequently look at this image and ask if I arranged the red leaves. The answer is an emphatic, No! I usually go on to remind them that you can draw a straight line between any two objects on the face of the earth (or any other planet, as far as I know). In fact, the only arranging I do to an image is myself—circling, rising, dropping—and in that regard I’m quite aggressive. In the field I look for individual elements to isolate in my frame; or better yet, groups of elements. Of course finding a subject is not the end of the job—without properly positioning the subjects in the frame, the scene is likely to fail. But rather than moving your subjects (the lazy solution), move yourself. In this scene I circled the leaves slowly, camera to my eye, until the frame felt balanced. And while the leaves ended up at the “rule of thirds” points, that wasn’t a conscious decision on my part, but rather confirmation that the rule of thirds is indeed valid (sometimes). What is the rule of thirds? Very simply, imagine a tic-tac-toe grid on your frame—the Rule of Thirds says that important linear elements (like the horizon) should be on the lines, and important compositional elements (like these leaves) should be at (or near) the intersections. I think the Rule of Thirds true value is to help remind beginners not to bullseye subjects, or not to crowd elements against the edges. In fact, I could probably show about as many successful images that break the Rule of Thirds as follow it. When I’m composing a shot, any Rule of Thirds voices in my head are overruled by my intuition, my sense for what what balances a frame, and even more simply, what feels right. I’ve never been much of a New Year’s resolution person, but the start of a new year is an opportunity to take stock and regroup. This year I’ve been thinking about the proliferation of derivative images online and in magazines, images that are, no matter how beautiful, simply reproductions of thousands of previous image. Photographers see something they like and go out try to get it themselves. I understand the urge to impress rather than create (for starters, it’s easier), and confess that I catch myself doing it too. As with pop music and formula fiction, the images that seem to sell best (not to mention garner the most Facebook Likes and “Stunning!” comments), are often facsimiles of preceding material. So photographers who make a living with their images are forced to subvert their creative instincts in favor of putting food on the table; and photographers who do it for pleasure are lured by the attention a well-executed duplicate generates. 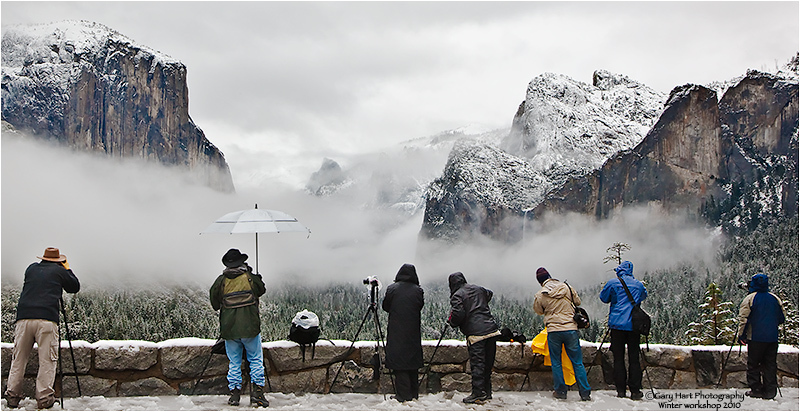 The problem is compounded for workshop leaders, who are paid to guide their customers to the iconic spots (why do you think you see so many Yosemite Tunnel View images in my gallery?). My solution is to follow the advice I give my workshop students: Rather than make the “classic” Tunnel View clearing storm or molten Horsetail Fall image your goal, make that image the starting point, before moving on to less conventional ways to capture the scene. 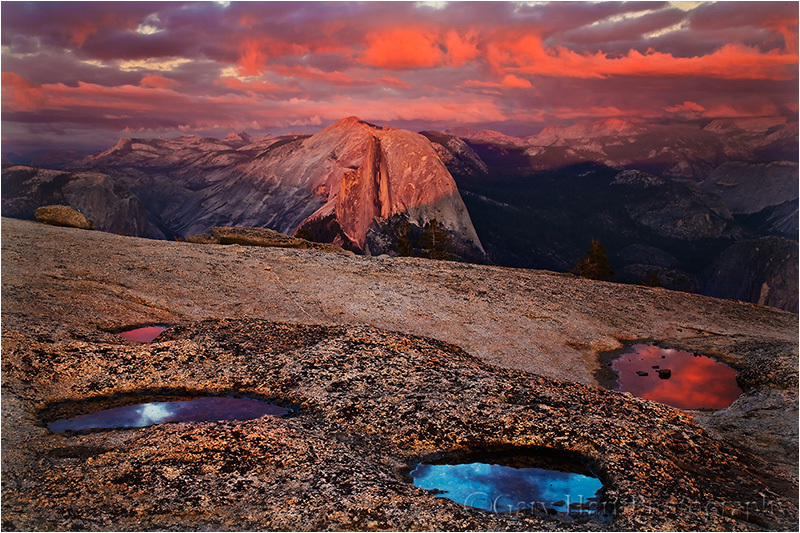 Which brings me to the Half Dome reflection image at the top of this post. The first instinct for most at this bend in the Merced River is to capture the wider scene (below), which I certainly did. But most of my clicks this evening were zoomed closer, concentrating on compositions that emphasize the reflection. I won’t pretend that I’m the first to photograph this scene this way—I share it here to illustrate the way I try to distill a scene to its most essential components. I was leading a group this evening and didn’t take a lot of pictures, but if I’d been by myself I’d have zoomed even tighter on the tree reflection, and certainly would have played with long exposures that would have turned the drifting foam into parallel white streaks. Even if finding the unique view is already part of your capture paradigm, challenge yourself to do it more. And because it’s only fair to hold myself to the same standard I ask of others, I’m also challenging myself to create more and settle less—it will be my mantra for 2015. This is a more conventional composition from this location. I captured it about ten minutes after the isolated reflection image above, for no other reason than I thought the twilight tones were pretty (knowing full well I’d probably not do anything with it). And that’s okay too. In fact, if it’s your first visit to a spot, starting with the conventional compositions is more than okay, is a great warm-up to familiarize yourself with the scene. In early November of 2007 I took a picture that didn’t quite work out. That’s not so unusual, but somehow this one stuck with me, and I’ve spent seven years trying to recreate the moment I missed that night. 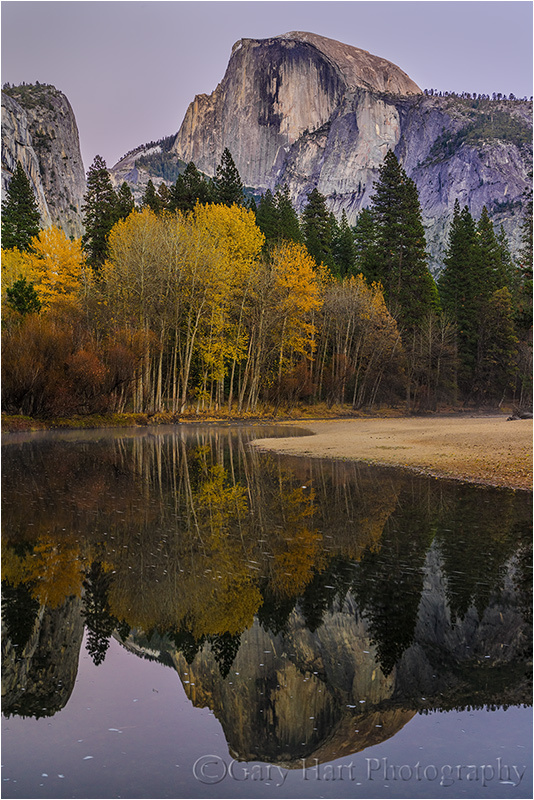 On that evening seven years ago, the sun was down and the scene I’d been working for nearly an hour, autumn leaves clinging to a log in the Merced River, was receding into the gathering gloom. The river darkened more rapidly than the leaves, and soon, with my polarizer turned to remove reflections from the river, the the leaves appeared to be suspended in a black void. Every few frames I’d add more light, weighing the noise introduced by a higher ISO versus the potential for motion blur of a longer shutter speed. Yet despite the great potential, I struggled to find a composition that would do the scene justice. About the time I decided my scene lacked a visual anchor, a place for the eye to land, a leaf drifted along the top of my frame and I clicked. On my LCD the result looked perfect, and I felt rewarded for my persistence. But back home on my large monitor, I could see that everything in the frame was sharp except my anchor point. If only I’d have bumped my ISO instead of my shutter speed…. Intrigued by the unrealized potential, I returned to this spot each autumn, but the stars never aligned—too much water (motion); dead (brown) leaves; no leaves; too many leaves; no anchor point—until this week. Not only did I find the drought-starved Merced utterly still, “my” log was perfectly adorned with a colorful leaf assortment anchored by an interlocked pair of heart-shaped cottonwood leaves. I worked the scene until the darkness forced too much compromise with my exposure settings. In the meantime, I filled my card with horizontal and vertical, wide and tight, versions of the scene with the log both straight and diagonal. I also played with the polarizer, sometimes dialing up the reflection of overhanging trees. But I ultimately decided on the one you see her, which is pretty close to my original vision. I can’t begin to express how happy photographing these quiet scenes makes me. I’ve done this long enough to know that it’s the dramatic landscapes and colorful sunsets that garner the most print sales and Facebook “Likes,” but nothing gives me more personal satisfaction than capturing these intimate interpretations of nature. The difference between a photographer and a tourist is easily distinguished by his or her response to rain: When the rain starts, the photographer grabs a camera and bolts outside, while the tourist packs up and races for shelter. This week Don Smith and I traveled to Hood River, Oregon for some autumn photography, and to do more prep and reconnaissance for next spring’s Columbia River Gorge photo workshops. It’s rained every day we’ve been here, and you won’t find two happier (albeit wetter) photographers. Not just because our California bones miss rain (they do), but because there is no better time to take pictures than a rainy day. Monday morning Don and I drove to Lost Lake to scout it as a potential workshop location. Climbing from near sea level to over 3,000 feet in a steady rain, we passed through deciduous forests in varying stages of green, yellow, orange, and red. The fall color peaked at around 2,000 feet, dwindled as we climbed further, until by the time we reached the lake, most of the colorful leaves were on the ground or whisked away by mountain breezes. While Mt. Hood was completely obscured by rainclouds, we spent a couple of hours exploring near the lake before heading back down the mountain with no specific plan other than to stop somewhere and photograph the color we’d enjoyed on the drive up. Partway down the mountain we pulled over beside an evergreen forest liberally mixed with yellow and red maples, donned our rain gear, and went to work. With dense, low clouds shrinking the view to just the immediate vicinity, grand panorama were out of the question and my 70-200 became my weapon of choice for its ability to isolate nearby leaves and limit depth of field. An essential but frequently overlooked component of successful rainy day photograph is a (properly oriented!) polarizer to mitigate the ubiquitous, color-sapping sheen reflecting back from every exposed surface. This is a no-exception thing for me—I don’t care if it’s already dark and the polarizer robs me of two more stops of light, without it, images from wet scenes like this would be a complete failure. In this case I bumped my ISO to 400 (and would have as high as necessary if there had been more wind) before composing a single frame. Beautiful as it was, a scene like this starts as a hodgepodge of disorganized color. Fortunately, it’s never long before individual elements start manifesting—the longer I stay, the more (and smaller) detail I see, until even the littlest thing stands out and I can’t believe it had been there all along. Knowing all this, I usually start at my lens’s wider range and gradually work tighter as the surroundings become more familiar. And so it was with this little leaf, tucked into the forest behind several layers of dense and dripping branches, hiding from my gaze until nearly an hour into my visit. From the forest’s outskirts I zoomed to 200mm and composed a few frames through the tangle of branches, but it wasn’t long before I needed to be closer. When I spy something interesting, it’s easy to crash through the forest like an angry grizzly (or frightened bison), but because I was extremely concerned about dislodging the fragile raindrops, I found myself deliberately stalking my prey, more like a stealthy cougar. (I could have just as easily compared my advance to a slithering snake, but for some reason this cougar analog resonated with me. Go figure.) When I made it so close that I was inside my lens’s focus range, I added an extension tube, and finally a second tube. By this time I was just a few inches from the leaf, and while this ultra-close view was pretty cool, I felt my frame needed more that just a pretty leaf. Until this point I’d been pushing the nearby branches and leaves aside, out my view. But realizing that I was so close (the leaf closest brushed my lens), and my range of focus was so thin, that they would blur to a smear of red that cradled my subject. With a paper-thin depth of field, finding the right focus point is essential. I also knew that I wouldn’t be able to get the entire leaf sharp, so I used live-view to focus on the center water drop (because that’s where I want my viewer’s eye to start). Few things get a photographer’s heart racing more than the vivid yellows, oranges, and reds of autumn. And the excitement isn’t limited to photographers—to appreciate that reality, just try navigating New England backroads on a Sunday afternoon in October. 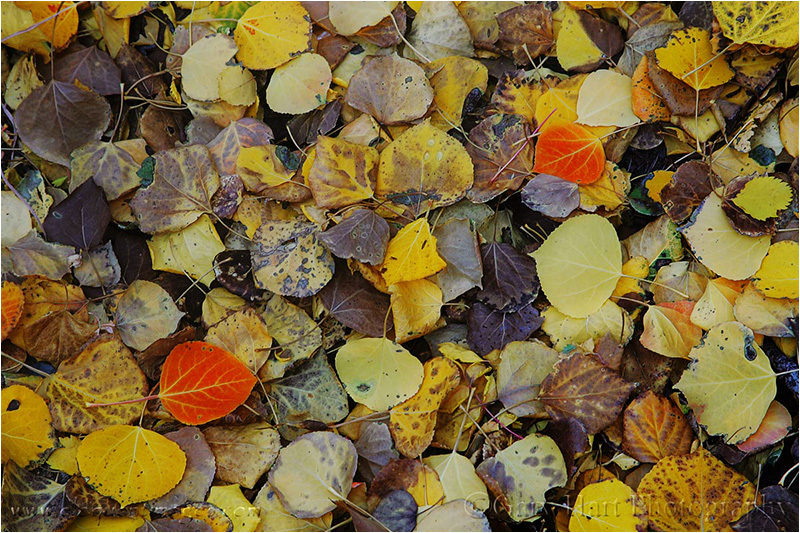 The leaves of deciduous trees contain a mix of green, yellow, and orange pigments. During the spring and summer growing season, the green chlorophyl pigment overpowers the orange and yellow pigments and the tree stays green. Even though this chlorophyl is quickly broken down by sunlight, the process of photosynthesis that sustains the tree, during the long days of summer it is continuously replaced. As the days shrink toward autumn, things begin to change. Cells at the abscission layer at the base of the leaves’ stem (the knot where the leaf connects to the branch) begin the process that will eventually lead to the leaf dropping from the tree: thickening of cells in the abscission layer blocks the transfer of carbohydrates from the leaves to the branches and the movement of minerals to the leaves that had kept the tree thriving all summer. Without these minerals, the leaves’ production of chlorophyl dwindles and finally stops, leaving just the yellow and orange pigments. Voila—color! My first visit to Zion National Park, three years ago, found the fall color peaking. I’d love to say this was through expert knowledge and careful planning, but it just happened that I’d been helping Don Smith with a workshop in Moab and we’d tacked on an extra day to play in Zion. We arrived early enough in the afternoon to explore and shoot for several hours before sunset, and were so thrilled by what we’d found that we decided to return for an hour the or so the next morning before heading home. Though my time was limited, a couple of things made this morning’s shoot even more productive than previous afternoon’s. First was the familiarity I’d gained the day before. And second was the morning’s soft light and utter stillness. Anxious to get going, we started before sunrise and were the first people to enter the canyon that morning—without wind or human interference, the air was so still that it seemed even the river was whispering. In these conditions it’s easy to forget time, ignore the chill, and immerse myself in world devoid of human obligation and discomfort. What struck me most about Zion’s color was the crimson maples, a color we just don’t get in California. While yellow was ubiquitous, red leaves were quite plentiful too, and I tuned my vision to identify any red I could highlight against the predominant yellow. Identifying this bunch of red leaves was just the beginning of my composition. Isolating a subject requires more than positioning it in the frame’s two-diminsional up-down/left-right planes; it also requires controlling the virtual third dimension, depth, by careful management of the background and depth-of-field. In this case I refined my find by moving left/right and up/down until I was satisfied with the way the background complemented the red leaves. Equally important was finding the appropriate depth of field—too little DOF would mean not enough of the nearby red leaves, my subject, would be sharp; too much DOF much would risk resolving so much background that it would compete with my leaves. 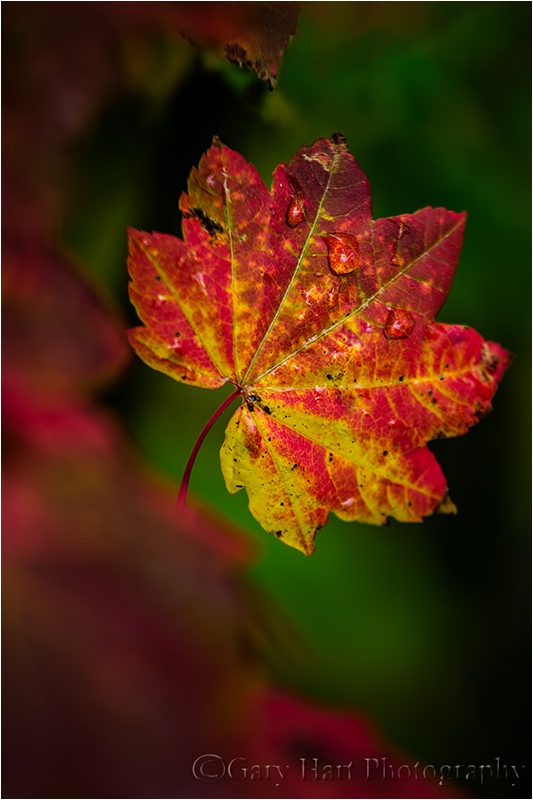 I decided to use my 70-200 lens, moving back far enough to include all of the red leaves at 200mm. That long focal length compressed the distance separating the foreground leaves and background trees (make the yellow trees seem closer to the red leaves). Because depth of field decreases with focal length, even at f16 background trees were soft enough. A few other subtle but significant considerations went into this image. First, note the long shutter speed: the air was so still that I had no qualms about using ISO 200, f16, and a polarizer, even though it dropped my shutter speed to four seconds. Also, don’t underestimate the importance of a polarizer in shady or overcast scenes: color-robbing glare from leaves’ waxy sheen is reduced significantly by a properly oriented polarizer. And finally, in front of these leaves were a few fluffy white seed pods—I knew they were close enough that at 200mm they would be blurred to little puffs of white, and simply decided to shoot through them. 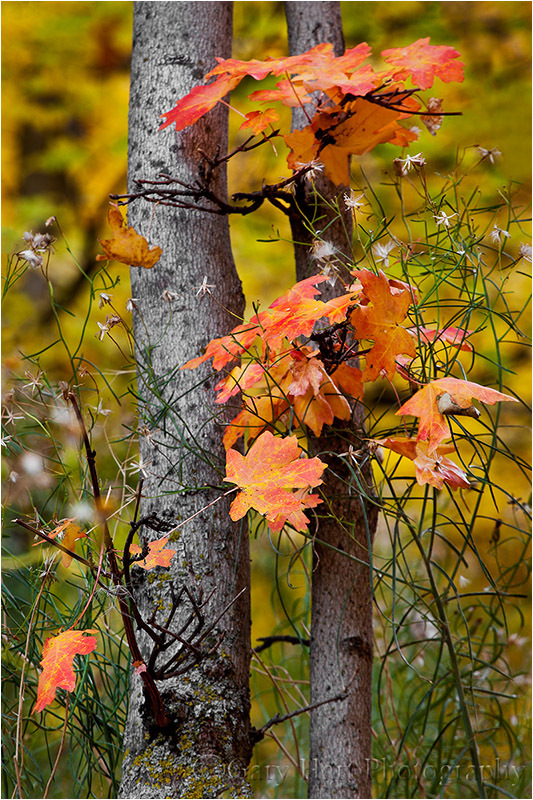 Read how to photograph fall color in my Fall Color Photo Tips article. Imagine that you want to send an eight-inch fruitcake to your nephew for Christmas (and forget for a moment that you’ve been come that relative), but only have a six-inch box. You could cut off one end or the other, squish it, or get a bigger box. If the fruitcake represents the light in a scene you want to photograph, your camera’s narrow dynamic range is the box. Of course the analogy starts to fall apart here unless you can also imagine a world where box technology hasn’t caught up with fruitcake recipes, but the point I’m trying to make is that whether it’s fruitcake or light, when you have too much of something, compromises must be made. 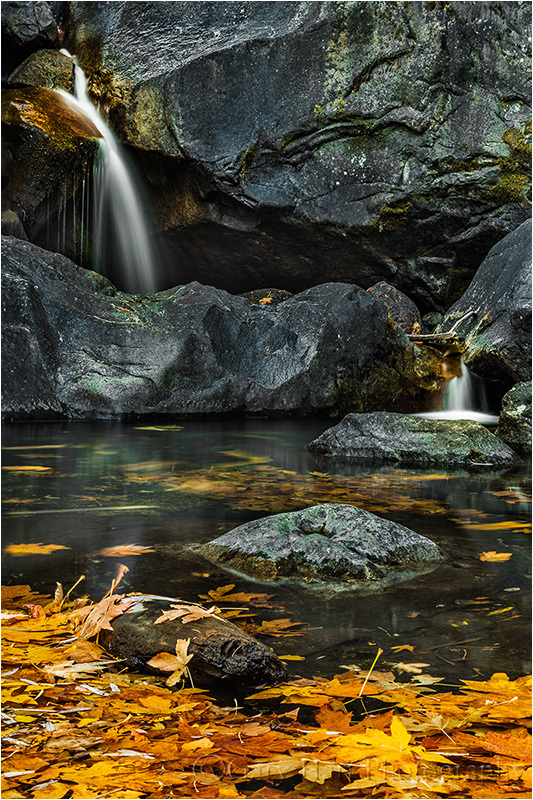 So, forgetting about fruitcakes for a moment, let’s look at this image of Bridalveil Creek in Yosemite. In full daylight on a sunny day the creek would have been a mix of sunlight and shade far beyond a camera’s ability to capture in a single frame—photographing it would have forced me to choose between capturing the highlights and allowing the shadows to go black, or capturing the shadows and allowing the highlights to go white. But photographing the scene in full shade compressed the dynamic range naturally, to something my camera could handle—suddenly everything was in shadow, and all I needed to do was keep my camera steady enough for the duration of the shutter speed necessary to expose the scene at the f-stop and ISO I chose. I love photographing a colorful sunset as much as the next person, but I’m never happier as a photographer than when I’m able to play with a pretty scene in full shade. Overcast skies are great because they allow me to photograph all day, but because clouds are never a sure thing, at every location I photograph I try to have weather-independent spots that will allow me to photograph when clear skies fill the rest of the landscape with sunlight. For example, Bridalveil Creek—nestled against Yosemite Valley’s shear south wall, much of the year Bridalveil Creek is in full shade until at least mid-morning, and then again by mid-afternoon. I never have to worry about what the light is here because I know exactly when I’ll find it in wonderful, (easy) low contrast shade. The morning I captured this image was one of those blue sky days that can shut a photographer down, but I knew exactly where I needed to be. Arriving at about 8 a.m., I had several hours of shooting in easily manageable, constant light. 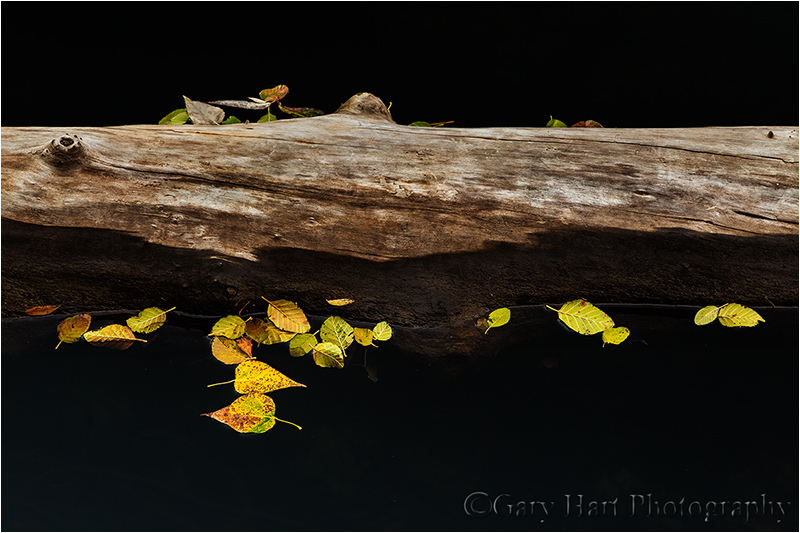 As I scrambled up the creek toward the fall, I fired off a few frames but nothing stopped me until I came across this small pool swarming with recently fallen leaves. A couple of “rough draft” frames were enough to know that there was an image in here—I just needed to find it. I suspected I needed to be closer, but between the large, slippery rocks and frigid creek, movement was quite difficult. Nevertheless, with each composition I seemed to manage to work my way a little closer, until I finally found myself at water’s edge. I started my composition at eye level, but that gave me too much water. To better balance the background cascade, middle-ground pool, and foreground leaves, I dropped down to about a foot above water level—this allowed me to include the foreground leaves with a telephoto that brought the cascade closer and shrunk the water separating the two. Framing the scene this way required zooming to 60mm; because I wanted as much sharpness throughout the frame as possible, I stopped all the way down to f22 (an extreme I try to avoid). While the dense shade made the scene’s dynamic range manageable, it also made it quite dark; adding a polarizer to cut the glare subtracted two more stops. Sometimes I can increase my ISO enough to achieve a shutter speed that gives a little definition in the water, but given all the other exposure factors I just cited, my water was going to be blurred no matter what ISO I chose. So I decided to go the other direction and maximize my shutter speed to emphasize the motion of the leaves swirling on the pool’s surface. FYI, your nephew would probably prefer an Amazon gift card. And if you must send a fruitcake, this one looks good (feel free to try it and send a sample). Any location’s “official” sun and moon rise/set times assume a flat horizon—if you read that today’s moonrise is at 5:00 p.m., you need to account for the time it takes for the moon to rise above whatever obstacles (mountains, hills, trees) are between you and the flat horizon. And due to the same motion around Earth that causes the moon’s phases, anyone planted in the same location night after night would see the moon rise about fifty minutes later each day (this is an average—the nightly lag varies with many factors). For example, a moon that hovered right on the horizon at sunset last night will rise too late to photograph tonight. While you can’t do anything about the moon’s absolute position in the sky, you can control the elevation of your horizon simply by changing your location. In other words, careful positioning makes it possible to photograph a moonrise at sunset on multiple nights—move lower and/or closer to the horizon to delay the moon’s appearance, higher and/or farther to view the moon sooner. The earlier the moon will rise, the closer to your subject (for example, Half Dome) you should be to increase the angle of view; the later the moonrise, the farther back and higher you should be. So, positioning ourselves on the valley floor, close to Half Dome, provided a steep angle of view that delayed the moon’s appearance on Thursday night, when it rose (above a flat horizon) several hours before sunset. Conversely, standing at elevated Tunnel View a couple of nights later decreased our angle of view, enabling us to see the moon sooner when official moonrise is closer to sunset. Last Saturday night, from Tunnel View on Yosemite Valley’s west side (farthest from Half Dome) the moon was “scheduled” to appear about five minutes after sunset—that would put it in the magenta, post-sunset band with just enough light for about ten minutes of shooting before the dynamic range (the brightness difference between the sunlit moon and darkening foreground) shut us down. While that was the shoot we were most looking forward to, for Friday night I’d picked a mid-valley spot by the Merced River that would put the moon above Half Dome just about sunset. And for our initial sunset on Thursday evening, I took the group to a riverside spot on Yosemite Valley’s east side, much closer to Half Dome. Clouds obscured the moon Friday night, but Thursday night was a real treat. Not only did we find the fall color in the cottonwood trees upriver still hanging in there (despite a fairly early autumn in most of Yosemite Valley), the clouds parted just in time for the moon’s arrival. In addition to Half Dome, the trees, and the moon in the distance, we were able to get a mirror image of the scene reflected on the glassy surface of the Merced River at our feet. While the downside of moving closer to Half Dome (or whatever your subject is) is that the wider focal length necessary to include the entire scene also shrinks the moon, I’ve always believed a small moon adds a powerful accent that makes an already beautiful scene even more special. But what if you prefer your moon big? Simple: just wait a day or two, and move back as far as possible. Stay tuned…. Join me next fall as we do this all over again. One final point: Notice the cool (blue) color cast of this scene. This is an indication of not just the rapidly advancing twilight, but also the depth of the shade there in the shadow of the steep valley walls and dense evergreens. An image’s color temperature is a creative choice made during processing by photographers capturing in raw (unprocessed) mode. While warming the light would have made the trees more yellow, I decided that the coolness adds a soothing calmness that is lost in the warmth of a daylight scene.